Clogged drains? Whatever you do, don’t call a plumber without trying these frugal, green tips first. Try these tips if your pipes are draining slowly. Pour lots of boiling water down the drain, then repeat and repeat and repeat again. Clogs are often caused by grease and other fats sticking to the inside of the pipes and then food and other matter sticking to the grease. (I do hope you’re not in the middle of eating!) Boiling water can help to dissolve the grease and get things flowing again. Pour about 1/2 a cup of baking soda down the drain and then add a cup of vinegar. Cover quickly with a drain plug so that the foaming action stays in the pipes. Let sit for an hour and then add a little more vinegar. Follow with a boiling water chaser. Or you could combine the two techniques by dissolving 1/2 cup of baking soda in 3 cups boiling water and pouring down the sink. If your pipes are completely clogged, you could get out your plumber’s snake. What? Don’t have one? 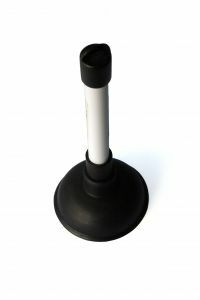 Then use your toilet plunger in the same way that you would to unclog your toilet. The pressure often works to dislodge a blockage. After you’ve tried working on the problem from above, you can try to solve it from within. This is the point at which I usually call my husband in however, so I’m not even going to try to give advice! Any good tips on how to clear a drain both frugally and environmentally? Thanks Michelle! And look for plenty more images. I’ve gotten the suggestion from so many people that I decided to do something about it. This is so bizarre Kelly because our drain clogged yesterday and a kettle of boiling water worked wonders! Thanks for the tips! 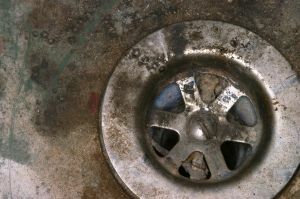 My drains get clogged ever so often and while the plumber is usually out of the question I hate using chemical laden products to get the clog out. These tips really are tested, tried and true. Our kitchen sink, especially, gets clogged with all sorts of junk, but doing these three things inevitably clears it out. Add some salt to the baking soda/vinegar combo – the coarseness will help to scour the pipes. I’ve also used a wedge of lemon and ice cubes to clean out my garbage disposal (supposedly, the ice cubes sharpen the blades, but… who knows about that!). I use the vinegar and baking soda all the time. In fact, it’s a good idea to do this once a month – before they get clogged. Dana’s last blog post..Why not Sara? Great tips!! From personal experience they all work! Frugal Trenches's last blog post..Daily Tracking Money and Food – Day 3! The plumber finally called yesterday and said he’d be back to work on the pipes under our kitchen sink in the next week or so. He apologized for it taking so long (he was over at the beginning of July to work on a leak under the house and hasn’t been back) and was just double-checking that he could still get the key from our neighbour. We really needed a plumber, plunging isn’t doing it and the pipes are 40 years old and not in any shape for us to be putting stuff like baking soda down them. Not only is the sink backing up, it’s leaking off and on into the cupboard underneath. I have no idea what it’s going to cost. Getting a plumber who was willing to come to our rural place was not easy. This guy was doing a huge job in a town about 10 minutes away. But he hasn’t billed me for the first lot of work yet, which is pretty amazing. Once the work is done I’ll try to remember to use vinegar and baking soda every time I change the baking soda in the fridge. That's what I do when our pipes get clogged and I'm happy to report we've never called a plumber! Good tips. Yes, this is the sort of situation where you definitely don’t want to be mucking around yourself. It will be a major hassle but just think of how nice it will be afterwards! The process wasn’t difficult, just involved a lot of paperwork, as all things French seem to do! Baking soda and vinegar can do so much amazing stuff! I have absolutely no idea if the plunging method is bad for PVC pipes. I have tried it once on my PVC pipes, and it worked just fine, but now you have me doubting. This is definitely a question I would ask a plumber. I've got a viciously clogged bathroom sink drain at the moment. I have not yet tried boiling water, but I will give it a go. Not sure that it will make it down to the clog, though. About the plunging method, I had heard that it can be bad for pipes, particularly PVC pipes. Is that true? We had the same problem and pulled up the same disgusting stuff! We were able to do it with regular tools too ((never used those kitchen tongs again) but somehow lost the screw that keeps the drain cover on and have tried to find a replacement and cannot find one that works!!! !